Have a passion for game development? Think you've got the skills to create a game in a single day? Then don't miss the 2nd annual London GameCraft! GameCraft is a games jam event designed around building the gaming community. We aim to create events which allow game-makers to meet, share ideas, have fun, compete for prizes and most importantly make games! The first GameCraft took place in Dublin in February 2012 in DIT with over 120 attendees producing more than 35 games. Since then Dublin GameCraft has gone from strength to strength with events in GamesFlá Thurles, in Belfast, and even a charity GameCraft for ISPCA. London GameCraft is a game jam event where folks come together to make games! Teams (or brave individuals,) get together and are given a theme early in the morning and from there have as little as 8 hours (sometimes 12 if we’re feeling generous). Games are built from scratch on any platform you like, at the end of the day the games are demoed by a panel of judges who award prizes for the best contenders. It’s a great chance to flex your creative muscles, tackle some quick and dirty coding problems, and to get out there and meet other game-makers face to face. You have 12 hours from then to make a game, followed by networking and play-testing (by the judges and your peers) and at the end winners are announced. We will provide all meals (including a beer & pizza reception in the evening) and refreshments throughout the day. Please bring your own laptop and power leads (you always need them). Each GameCraft event follows a theme, Andrea Magnorsky and a panel of experts are deliberating to find the best possible theme and it will be announced on the day! This event is open to over 18s only. We will look at running an event for under 18s in the future! Dublin GameCraft was started by game-dev Andrea Magnorsky and coder and tech event organiser Vicky Lee. The two met looking to create a fantastic game jam for the irish indie community, one that would become a staple part of the Irish game dev’s yearly diary. Many UK-based developers started attending, including our very own Phil Trelford so we decided that it would be awesome to bring the event to Skills Matter's global community to allow all gaming developers the chance to participate! Check out the Resources page for a few new tools to add to your game-making belt. 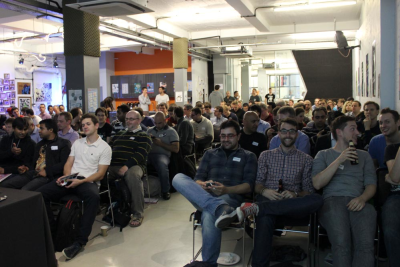 Want to support Europe's London's games developer community? Then be a contributor to London GameCraft and join us as a sponsor! For more information check out our sponsorship pack Or email us with your objectives and ideas and we'll be in touch on how we can support you! Check out our sponsorship options here! Have a passion for game development? Think you've got the skills to create a game in a single day? Then don't miss London GameCraft! 2015! Skills Matter is delighted to announce that it will host the first ever New York GameCraft event on Tuesday 17th September at the DUMBO Spot!